What do you do, Ron Medzon? Each hospital in Boston is known to have its own “personality.” While Boston Medical Center is known for providing exceptional care without exception and focusing on social determinants of health, Boston Children’s Hospital is recognized for its breadth and depth of pediatric specialties and subspecialties. 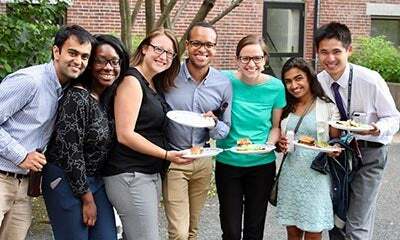 These complementary strengths and missions provide a wide range of pediatric care throughout the city of Boston, and each year a new group of residents has the chance to learn from both through the Boston Combined Residency Program. The residency program has approximately 150 residents, making it one of the largest pediatric residency programs in the United States. Most of those residents are categorical residents, which means they are officially employed by Children’s Hospital and spend 60-70 percent of their time there. Approximately 20 percent of residents, who are employed by BMC, are in the Urban Health and Advocacy Track (UHAT), which provides them with extra opportunities for advocacy and public health outside of the clinical space. Both tracks go through the same clinical rotations – at both hospitals – and educational programs. Clinical practice for all residents includes not just the typical general and specialty rotations, such as oncology or emergency medicine, but also learning how to be a top community physician. To this end, the program leverages the wide network of community health centers and private practices affiliated with both hospitals to ensure residents have a variety of experience. In addition, residents go through an advocacy rotation, to help ensure that they develop into doctors who are knowledgeable about the communities they serve. One of Rainer’s experiences highlights this unique aspect of the program. On a BMC inpatient ward rotation, she cared for a 13-year-old girl who had been in and out of the Emergency Department with shoulder and back pain. She had been admitted this time, and stayed at BMC for two weeks for testing; many specialties were involved, from pediatric hematology-oncology to pediatric rheumatology. Eventually, the patient was given a new cancer diagnosis. The patient was living with her grandmother and the family had many financial hardships. But doctors at both hospitals advocated for her transfer to Children’s Hospital for chemotherapy, to get the best specialized care possible. The pediatric residents who cared for the patient at BMC can now care for her at Children’s on oncology rotations and at BMC when she comes back to the ED. Another goal of the program is to deliver time for residents to pursue their individualized academic interests. A three-month block of self-directed academic development time is built into the third year of residency, where residents are expected to take advantage of the minimal clinical time for academic pursuits. The program also provides support for scholarly development through four academies designed to help residents explore different aspects of academic leadership (medical education, clinical investigation, basic science investigation, innovation). Formal development as a teacher and supervisor are also stressed in a Resident-as-Teachers rotation, where residents are paired with a coach to learn how to effectively teach and supervise others. UHAT provides additional educational opportunities for residents in that track, including “work-in-progress” meetings, where residents brainstorm legislative, advocacy, and research initiatives they’re interested in, then bring in BMC leaders in those areas to learn more. The program also stresses informal and formal vertical mentorships across UHAT classes. In addition, working at two different hospitals, with different systems, electronic health records, protocols, and structures, provides residents with a unique view that will help them as they finish residency and move to other hospitals. According to Michelson, the curriculum has significantly changed since the beginning of the program, and will keep evolving as health care needs change. For example, program leadership is currently considering the best way to equip pediatricians to care for mental and behavioral health issues, potentially in the form of a new rotation. The program is also committed to involving residents in activities related to accountable care organizations by pairing interested students with leaders in the space and building in elective time for them to learn more. “We’re always thinking about the next horizon in health care, and our residents make sure we are continuously evolving,” says Michelson. What does it take to be an improvement champion? Curiosity, leadership, and a motivation to initiate change – all qualities of 16 employees who recently completed BMC’s Quality Improvement (QI) Leadership Academy. Launched in January 2018 in partnership with BU’s School of Continuing Medical Education, the program aims to guide both clinical and non-clinical mid-level managers through an improvement project of their choice, under the supervision of a trusted executive mentor. A team of 15 multidisciplinary leaders, including doctors, registered nurses, and quality experts, volunteered countless hours to mentor participants and equip them with the skills and resources necessary to achieve sustainable results. Each employee enters the program with an idea for an improvement project and immediately begins developing their aim statement, defining outcome measures, and planning their execution process. All of the projects are strategically important to the employee’s department and directly impact BMC’s organizational goals. The inaugural class submitted projects that spanned the scope of interpreter services innovations to guardianship process improvements. Guardianship is a legal appointment to an individual that authorizes them to make health care decisions on behalf of an incapacitated patient without a proxy. In the past, BMC’s legal department has played a large role in helping people obtain guardianship when no family or friends were available. This unfortunately caused delays that affected how long patients remained admitted. “I still can’t believe how much my partner [Dianne Yacovone] and I managed to accomplish in less than a year,” said Wendoly Langlois, Associate General Counsel and program participant who completed an improvement project on our guardianship process. “Not only did our project make significant reductions to the average length of stay for our guardianship patients, but it also made extensive improvements to the hospital’s overall guardianship process. The whole experience was enlightening, as it exposed my team’s ability to drive change within the hospital in a way that wasn’t directly tied to our specific roles,” she said. The second class of QI Leadership Academy participants was just recently confirmed, with 20 employees ready to embark on their improvement journeys. Beginning in February, participants will meet their QI mentors, begin formulating their hypotheses, and finalize their process maps. Projects are expected to be completed by late November. If you have a quality improvement project in mind and would like to participate in the next round of the program, please visit the QI Hub website for more details. A: I work clinically in the Emergency Department as an attending physician, teaching residents and students. When I'm not in the ED, I work at the Solomont Simulation Center (Sim Center), where I've been the director for the past three years. The Sim Center is a state-of-the-art facility for clinical education and interdisciplinary professional training. We have created realistic patient-care environments so that we can simulate virtually any clinical situation. Basically, any activity related to patient care that can be improved through simulated role-playing can be facilitated in the center. We have a full-time staff to take any department or team from concept to program. It’s a fun way to learn, it’s effective, and best of all, it’s free to anyone who works at BMC. Q: What inspired the launch of the Sim Center? A: A decade ago, I attended an amazing presentation by the program director for the Israel Center for Medical Simulation that changed my whole concept of patient safety and the way we provide medical education. It is human nature to learn by doing, so the best way to perfect a particular procedure or process is to practice it repeatedly and then reflect on areas of improvement. The simulated environment gives people the opportunity to do just that. After leaving the event, I knew that we needed to adopt a similar mindset at BMC, not just for the benefit of medical staff and students, but for all departments across campus. Q: Were there challenges getting the program up and running and how did you overcome them? A: One of the biggest challenges we faced was increasing awareness of our existence and availability to help both clinical and non-clinical staff. It’s easy to illustrate how simulated procedures can help doctors and residents. But it was a little bit more difficult for people to grasp how non-clinical procedures can be enhanced with our help. A prime example of us trying to overcome that challenge is when we booked a cultural competency training with our Environmental Services team. We had staff role-play patients of different cultures. Using the safe space of simulation, they were able to have discussions about what may or may not be considered appropriate for some of our patients. For example, is it okay for a male employee to enter a room with a female patient to do a simple task such as empty the trash? Our Environmental Services staff learned a lot from that training. It definitely made them feel more confident in their ability to do their jobs at the highest possible standard. Q: What do you think participants appreciate most about the Sim Center? A: In the typical work environment, communication barriers can affect the way employees collaborate. For example, sometimes technicians in the OR are hesitant to interrupt the surgeons, which keeps them from speaking to the surgeons. I think participants love the fact that when their team enters the Sim Center, those barriers are completely eliminated. Everyone has facetime with their colleagues in a simulation. They get to establish a comfortable rapport with one another in a stress-free environment. This helps foster greater communication amongst the team, which improves patient safety and ultimately allows us to deliver better care. I have to attribute the success of the Sim Center over the years to my amazing team of doctors, nurses, and technicians. Last year, we completed nearly 1,600 programs and over 30,000 user hours, thanks to their efforts. Q: What are your top priorities for the Sim Center this year? A: I am really focused on increasing our number of ongoing, regularly scheduled team trainings. Since we launched, it has been proven that team trainings lead to valuable results for departments and patients. Currently, our Sim Center is one of the busiest in the state for team trainings, which is definitely something to be proud of. I want to keep that momentum going in 2019. A: I’m from Canada, so I obviously have to play ice hockey to keep my passport current. I enjoy biking, cooking, playing music, reading, traveling and hiking with my family, including my dog Louie. I also do medical work in Haiti, Honduras, and more recently Fort Defiance, which is on a Navajo reservation in Arizona. Even though I’m technically working, it’s always a very gratifying experience and tons of fun. What if the narratives we’re taught about great leaders are not the full story? According to Crystal Ann Williams, Boston University's Associate Provost for Diversity & Inclusion, at this year’s annual Martin Luther King, Jr. Day Celebration, we all learn that Martin Luther King, Jr. and other civil rights leaders were larger than life. But in order to continue fighting for justice, we need to look beyond those narratives and understand that it’s not only those who are larger than life who can make a change. A trip Williams took to cities integral to the civil rights movement, such as Selma and Montgomery, Alabama, led her to think about these questions of how we can look beyond the typical history we’re given in order to be inspired to doing the work of activism. One role model Williams suggested was a woman she met in Selma, Alabama, who advocated for 20 years to have an MLK quote on a Selma church plaque changed. While the quote should be “I have a dream…” the plaque reads “I had a dream,” which the woman worried would suggest to young people that they can’t be part of MLK’s dream for the future. Finally, after 20 years of work, the plaque was changed. With that in mind, Williams asked the audience to interrogate the narratives of faith and hope that we so often hear, because the real stories give us more models for engaging more effectively with the world. While faith and hope are seminal for both human life and civil rights, change also takes hard work, planning, and many small decisions. In particular, Williams noted the hundreds of black women who ran churches and meetings, cooked, drove, and made action plans as part of the civil rights movement. While these women helped keep the mechanics of political change going, most people don’t learn their names or their actions. They would learn, suggested Williams, about the power of small actions and average people to effect change. Bristol-Myers Squibb Company and Boston Medical have announced a multi-year joint research study to identify and analyze potential sensitivity and resistance markers in patients treated with standard-of-care checkpoint inhibitors. The comprehensive, multi-dimensional study will place an emphasis on uncovering mechanisms associated with lack of response to Immuno-Oncology (I-O) therapies, with the ultimate goal of identifying prognostic and potentially predictive I-O biomarkers in a variety of cancers. 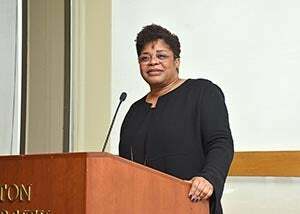 Angela Jackson, MD, an internist in Primary Care and associate dean of Student Affairs at Boston University School of Medicine, has received the 2018 Jerome Klein Award. Jackson has been part of the medical campus for 30 years, since her residency at Boston City Hospital. She was also appointed by former Secretary of Health and Human Services Kathleen Sebelius to serve on the Health Resources and Services Administration Advisory Committee on Training in Primary Care and co-wrote the Committee’s report to Congress, Priming the Pump of Primary Care. Jackson has also served on 28 committees at BMC and BUSM. The Jerome Klein Award for Physician Excellence was established in 2010 to commemorate Klein’s 50 years of service to BUSM/BMC and is presented annually to a physician who shares Dr. Klein’s attributes, including clinical and research excellence, leadership, and dedicated commitment to education and mentoring. John Renner, MD, director of the Addiction Psychiatry Residency Training Program, has been selected by the American Psychiatric Association to receive their Distinguished Service Award. This honors an individual or organization of exceptional meritorious service to the field of psychiatry.